The Roudham, Norfolk-based The English Whisky Co. have announced the release of a new Small Batch Release whisky. This single malt was distilled in July 2013 and spent its life in virgin American oak casks, until bottling in March 2019. Only 2.689 bottles of this English single malt whisky are available world wide. 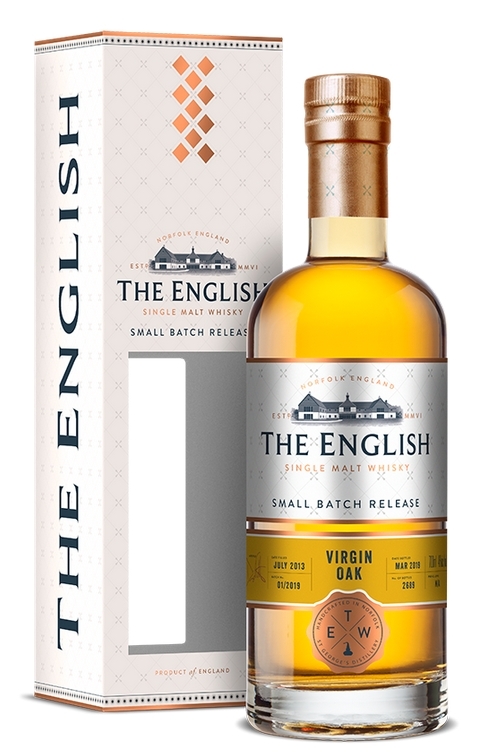 The English Small Batch Release Virgin Oak is bottled at 46% abv and sold at a recommended retail price of £51.99 for a 70cl bottle. The nose contains coconut and liquorice with hints of toffee and dark chocolate. Light vanilla and rich oak. Wood spices think cloves and nutmeg. The taste is rich and oily. Spicy, the notes of dry oak and vanilla come through. Hints of honey, toffee, chocolate and cloves linger on the palate.